no-boil everything bagel/bialy with garlic and dill whipped cream cheese, originally uploaded by aarn! +1st April, 2009+. just to start things out, a few days after this meal there was an experiment involving pretzel making and it is clear that it's just not a bagel unless it's boiled. these are more of a bialy, but whatever. took 1-lb of all-purpose wheat flour and 1/5-lb of dark rye flour and mixed that into 1 3/4c. of room temp water, with 2T. salt, and 1t. dried yeast, and 3-oz. of creamed butter. let the dough prove for an hour in the mixing bowl, then shaped into a large log on a floured work surface, cut into 12 equal segments, patted some of the segments relatively flat and pushed a hole through with the bottom of a floured shot-glass, some of them were rolled and then pinched together (these worked out much better). each bagel shape was placed on parchment paper on a baking sheet, brushed with water, and then sprinkled with some really nice spices (garlic flakes, blue poppy seeds, onion flakes, raw sesame seeds, and coarse sea salt) from christina's in inman square, and then left to prove for an additional 30-40 minutes, then the baking sheets were transferred to a 400-degree oven with a water bath in the bottom, and let to bake for 20-25-minutes. cream cheese was whipped with a paddle in the mixer until fluffy and then added to it was salt, fresh chopped dill, scallions, red onion, crushed garlic, and finely chopped celery. 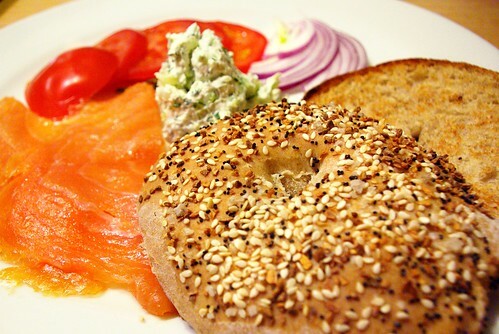 the bagels were sliced and then toasted under the broiler for a second, and plated with thinly sliced red onion, smoked atlantic salmon, and sliced tomatoes.